Spray a wok with a few sprays of frylight and place on high heat. Add the chicken and prawns and fry for 5 minutes until cooked through. Add the stir fry veg packet and mix with chicken and prawns for 1 minute. Add soy sauce and noodle seasoning and coat vegetables, chicken and prawns evenly. Reduce to a medium heat and leave cook for 5 minutes, stirring occasionally. Very quick, easy and full of flavour. Stir fry is a great way to pack loads of veg into your main meal and it tastes so yummy. The noodle seasoning mix gives this dish an extra little bit of flavour. 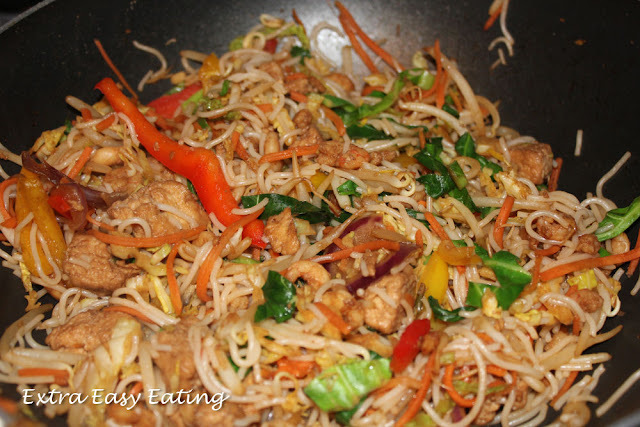 This dish would be great if you have family members who still enjoy takeaways, so your getting a healthy chow mein style dish to eat along side them without all the calories.